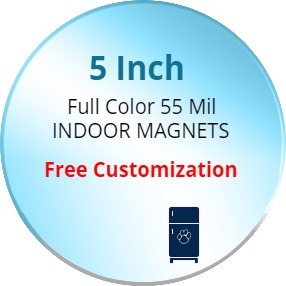 5 Inch Custom Printed Circle Magnets - Indoor Magnets 55 Mil are wonderful promotional materials that will keep your brand information displayed in front of people throughout the year. The greater thickness makes these custom magnets more durable and strong. Thus, they are capable of holding more pictures, loose papers and bills than normal. Organizations, brands and events can be promoted using these custom circle magnets that are Made In United States. Order these products today to get free design, no set up fee, free shipping in the Contiguous USA and full color processing. Request a quote to know what you can save on ordering these 5 Inch Custom Printed Circle Magnets - Indoor Magnets 55 Mil in bulk.